A properly designed and implemented certification program gives the professional and consumers an assurance of competency. The fitness industry in particular is an ever changing profession with new research and data coming out all the time. Safely directing a client as a Certified Personal Trainer or fitness professional needs a validation of knowledge that has been reviewed by other subject matter experts in the profession. The certification will give the candidate a solid reputation, credibility and confidence to do the job successfully. Certification as a W.I.T.S. Certified Personal Trainer — Level I demonstrates entry-level fitness specific competency and a commitment to consumer safety by individuals who help to improve the health and fitness for clients ranging in age, health, and fitness status through the development and implementation of fitness programs required for practice in the service industry in the United States. Individuals who earn the CPT – Level I designation are qualified to implement personalized exercise programs to clients that have no special medical conditions nor specialized physical limitations that would require advanced knowledge or skills. The W.I.T.S. Certification Council (“Council”) was established in 2016 to promote the highest standards for fitness professionals through the development, implementation, coordination, and evaluation of all aspects of the certification and certification renewal processes. The Certification Council is an independent and autonomous governing body for the Personal Trainer Specialist I certification program. The purpose of the Certification Council is to develop, maintain, and administer certification programs for the fitness and health profession in the United States and to enhance public protection. The Council recognizes individuals who are qualified to help improve the fitness and health of clients ranging in age, health, and fitness status through the development and implementation of fitness programs. Certification programs offered by the Council will be developed and administered in compliance with nationally accepted accreditation standards for certification programs. The Certification Council is responsible for establishing, reviewing, and overseeing implementation of the policies for the certification programs. The Council has the sole authority to establish policies for certification eligibility, development and scoring of the examinations, administration of the examinations, recertification requirements, and operations of the certification program. Members of the Certification Council are selected to represent the diverse demographic characteristics, roles, and settings in which health and fitness professionals practice. The Council works with contracted testing consultants to develop and administer the certification examinations. Testing consultants are selected for their extensive experience in the development and administration of professional certification examinations that comply with national accreditation standards for certification programs. Development and maintenance of the Certified Personal Trainer —Level I examinations are based on a Job Analysis Study process that is designed to ascertain, directly from practicing professionals, the frequency with which prerequisite knowledge is applied in practice and the importance or criticality of this knowledge. Content is added to the examinations only after it has been identified through this process and accepted by subject matter experts as required by the examination development policies in this manual. The Council is solely responsible for essential decisions related to the development, administration, and ongoing maintenance of the certification program. The Certification Council ensures that all application and eligibility requirements, examination development and administration, recertification requirements, and all certification program policies and procedures are directly related to the purpose of the certification program. W.I.T.S. adheres to principles of fairness and due process and endorses the principles of equal opportunity. In administering the certification program, W.I.T.S. does not discriminate or deny opportunity to anyone on the basis of race, color, creed, age, gender, national origin, religion, disability, marital status, parental status, ancestry, sexual orientation, military discharge status, or source of income. All candidates for certification will be judged solely on the published eligibility criteria determined by the Certification Council. W.I.T.S. Supports appropriate, professional standards designed to serve the public, employees, employers, consumers, and their clients. First and foremost, W.I.T.S.certificants and candidates give priority to providing services that safely improve the health and fitness for clients ranging in age, health, and fitness status through the development and implementation of fitness programs. W.I.T.S.certificants and candidates have the obligations to: maintain high standards of integrity and professional conduct; accept responsibility for their actions; continually seek to enhance their professional capabilities; practice with fairness and honesty; and, encourage others to act in a professional manner, consistent with the certification standards and responsibilities. Information regarding the complaint process will be available to the public via the W.I.T.S. website or other published documents. A complete copy of this policy will be made available to any individual upon request. In order to maintain and enhance the credibility of the W.I.T.S. 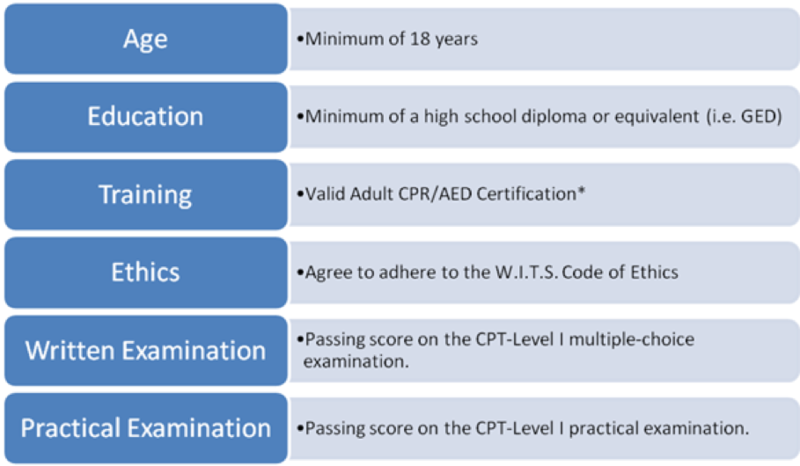 certification program, the Certification Council has adopted the following procedures to allow individuals to bring complaints concerning the conduct of CPT Level-I certificants to the W.I.T.S. Certification Council. In the event a certificant violates the W.I.T.S. certification rules, requirements, and/or policies, the W.I.T.S. Certification Council may reprimand or suspend the individual or may revoke certification. The Chair appoints a Review Committee of three or more individuals who are not members of the Certification Council to investigate and make an appropriate determination with respect to each such valid and actionable complaint; the Review Committee may review one or more such complaints as determined by the Chair. The Review Committee initially determines whether it is appropriate to review the complaint under these Procedures or whether the matter should be referred to another entity engaged in the administration of law. The timeline for responses and for providing any additional information will be established by the Review Committee. The Review Committee may be assisted in the conduct of its investigation by other members of the Certification Council or by W.I.T.S. staff or legal counsel. The Chair exercises general supervision over all investigations. Both the individual submitting the complaint and the certificant who is the subject of the investigation (or his or her employer) may be contacted for additional information with respect to the complaint. The Review Committee may at its discretion contact such other individuals who may have knowledge of the facts and circumstances surrounding the complaint. All investigations and deliberations of the Review Committee and the Certification Council are conducted in confidence, with all written communications sealed and marked “Personal and Confidential,” and they are conducted objectively, without any indication of prejudgment. Investigations and deliberations cease at the discretion of the Review Committee or when a certificant’s certification expires or is surrendered. W.I.T.S. notifies and cooperates with all appropriate authorities as necessary. An investigation may be directed toward any aspect of a complaint which is relevant or potentially relevant. Formal hearings are not held, and the parties are not expected to be represented by counsel, although the Review Committee and Certification Council may consult their own counsel. Certificants who are found to bring frivolous complaints against other certificants or W.I.T.S. may be subject to disciplinary action by the Council, up to and including revocation of certification. Upon completion of an investigation, the Review Committee recommends whether the Certification Council should make a determination that there has been a violation of W.I.T.S. policies and rules. When the Review Committee recommends that the Certification Council find a violation, the Review Committee also recommends imposition of an appropriate sanction. If the Review Committee so recommends, a proposed determination with a proposed sanction is prepared under the supervision of the Review Committee Chair and is presented by a representative of the Review Committee to the Certification Council along with the record of the Review Committee’s investigation. If the Review Committee recommends against a determination that a violation has occurred, the complaint is dismissed with notice to the certificant, the certificant’s employer (if involved in the investigation), and the individual or entity who submitted the complaint; a summary report is also made to the Certification Council. The Certification Council reviews the recommendation of the Review Committee based upon the record of the investigation. The Council may accept, reject, or modify the Review Committee’s recommendation, either with respect to the determination of a violation or the recommended sanction to be imposed. If the Council makes a determination that a violation has occurred, this determination and the imposition of a sanction are promulgated by written notice to the certificant and to the individual submitting the complaint, if the submitter agrees in advance and in writing to maintain in confidence whatever portion of the information is not made public by the Certification Council. In certain circumstances, the Council may consider a recommendation from the Review Committee that the certificant who has violated the certification program policies or rules should be offered an opportunity to submit a written assurance that the conduct in question has been terminated and will not recur. The decision of the Review Committee to make such a recommendation and of the Certification Council to accept it are within their respective discretionary powers. If such an offer is extended, the certificant at issue must submit the required written assurance within thirty days of receipt of the offer, and the assurance must be submitted in terms that are acceptable to the Certification Council. If the Council accepts the assurance, notice is given to the certificants employer and to the submitter of the complaint, if the submitter agrees in advance and in writing to maintain the information in confidence. termination of the certificants certification. For sanctions that include suspension or termination, a summary of the final determination and the sanction with the certificant’s name and date is published by the W.I.T.S. This information will be published only after any appeal has either been considered or the appeal period has passed. Reprimand in the form of a written notice from the Council Chair normally is sent to a certificant who has received his or her first substantiated complaint. Suspension normally is imposed on a certificant who has received two substantiated complaints. Termination normally is imposed on a certificant who has received two substantiated complaints within a two year period or three or more substantiated complaints. The Certification Council may, at its discretion, however, impose any of the sanctions, if warranted, in specific cases. Certificants who have been terminated will have their certification revoked and may not be considered for W.I.T.S. certification in the future. If certification is revoked, any and all certificates or other materials requested by the Certification Council must be returned promptly to W.I.T.S. Within thirty (30) days of receipt of notice of a determination by the Certification Council that a certificant violated the certification program policies and/or rules, the affected certificant may submit to W.I.T.S. in writing a request for an appeal. Upon receipt of a request for appeal, the Council Chair establishes an appellate body consisting of at least three, but not more than five, individuals. This Appeal Committee may review one or more appeals, upon request of the Chair. No current members of the Review Committee or the Certification Council may serve on the Appeal Committee; further, no one with any personal involvement or conflict of interest may serve on the Appeal Committee. Members of the Appeal Committee may be reimbursed for reasonable expenses incurred in connection with the activities of the Committee. Only facts and conditions up to and including the time of the Certification Council’s determination as represented by facts known to the Council are considered during an appeal. The appeal will not include a hearing or any similar trial-type proceeding. Legal counsel is not expected to participate in the appeal process, unless requested by the appellant and approved by the Council and the Appeal Committee. The Council and Appeal Committee may consult legal counsel. The Appeal Committee conducts and completes the appeal within ninety days after receipt of the request for an appeal. Written appellate submissions and any reply submissions may be made by authorized representatives of the appellant and of the Certification Council. Submissions are made according to whatever schedule is reasonably established by the Appeal Committee. The decision of the Appeal Committee either affirms or overrules the determination of the Certification Council but does not address a sanction imposed by the Council. The decision of the Appeal Committee, including a statement of the reasons for the decision, is reported to the W.I.T.S. Certification Council. The Appeal Committee decision is binding upon the Council, the certificant who is subject to the sanction, and all other persons. If a certificant who is the subject of a complaint voluntarily surrenders his or her certification(s) at any time during the pendency of a complaint under these Procedures, the complaint is dismissed without any further action by the Review Committee, the Certification Council, or an Appeal Committee established after an appeal. The entire record is sealed and the individual may not reapply for certification. However, the Certification Council may authorize the Chair to communicate the fact and date of resignation and the fact and general nature of the complaint which was pending at the time of the resignation, to or at the request of a government entity engaged in the administration of law. Similarly, in the event of such resignation, the certificant’s employer and the person or entity who submitted the complaint are notified of the fact and date of resignation and that Certification Council has dismissed the complaint as a result. It is strongly encouraged that the candidate read this handbook thoroughly to assure satisfaction before applying. Each eligibility requirement has been selected to support the purpose of the CPT-Level I credential. W.I.T.S. certifications are intended for individuals who wish to become employed in the United States. The majority of employers require reading comprehension and English proficiency. For these reasons, a high school diploma or its equivalent is accepted as the minimum educational requirement. W.I.T.S. requires that all applicants have successfully demonstrated hands-on skills needed to effectively perform adult cardiopulmonary resuscitation and the use of an automated external defibrillator (AED) for response to first aid, breathing and cardiac emergencies. W.I.T.S. certificants and candidates have the obligations to: maintain high standards of integrity and professional conduct; accept responsibility for their actions; continually seek to enhance their professional capabilities; practice with fairness and honesty; and, encourage others to act in a professional manner, consistent with the certification standards and responsibilities. All candidates and certificants are required to agree and adhere to an enforceable to Code of Ethics as a condition of certification. The online registry enables stakeholders to view the credentials of W.I.T.S. certificants, thereby enhancing consumer safety in the field of personal training. Applicants are required to pass both the written and practical CPT-Level I examinations to demonstrate that their education and training have resulted in a sufficient understanding of the knowledge, skills, and abilities required to provide safe and competent evidence-based personal training services as determined by the job analysis study and represented on the examination content outline. W.I.T.S. The request should state the reasons the candidate believes he/she is eligible for certification or recertification and how he/she complies with the published requirements. A $25 Appeal Review Fee is required with every appeal submitted. The Director of Certification will review the request within 15 days. If the issue cannot be resolved by the Director of Certification, the request is referred to the Council Chair and the Reconsideration Committee. The Reconsideration Committee will review the request and make final determination. The candidate is notified of the decision within 14 days. This process may take up to a maximum of 45 days to complete. W.I.T.S. provides an online application for the certification examination process. Applicants begin the registration process by completing an online application at www.witseducation.com/fit/certification/national-test-eligibility-requirements-exam-forms. Online applications are downloadable and may also be submitted via USPS. All applications must be received by W.I.T.S. a minimum of 35 days prior to the requested test date. An applicant may submit required documentation to W.I.T.S. either electronically, faxed, or USPS. W.I.T.S.is not responsible for documentation submitted on behalf of a candidate and will not return documentation. Originals should not be remitted. The following information must be submitted with the application form and is verified by W.I.T.S. certification staff. Applicants must submit a current copy of Adult CPR/AED certification that includes a practical skills examination component (i.e. American Heart Association; American Red Cross). W.I.T.S. requires a live, hands-on skills assessment verified by a qualified CPR instructor. To ensure that the applicant has read the Code of Ethics and agrees to adhere to its requirements, the application form will be reviewed to ascertain that the applicant has signed the Code of Ethics. A $350 examination fee includes registration for both the written and practical examinations. W.I.T.S. accepts payment in the form of check, money order, or credit card. Applicants incur a $35 fee for returned checks. An application is considered incomplete if any of the requested information is missing or illegible or the appropriate fee is not included. Candidates are notified once via email that the application is incomplete and what must be done to complete the application. If the candidate does not respond, an email notification is sent to inform the candidate that the application will not be processed. Applications must be complete before they are processed and approved. All applications for testing must be received by W.I.T.S. a minimum of 35 days prior to the requested test date. W.I.T.S. certification staff will review and process all applications and supporting documentation within three to five business days. Applicants whose applications are completed and approved are scheduled for testing and receive, via email, a notification with instructions to download and print the authorization to test confirming the requested test date, location, and exam day instructions. W.I.T.S. certification staff add eligible candidates to the test site’s official roster. Candidates with a confirmed testing appointment must contact the W.I.T.S. at least 14 days prior to the scheduled appointment to cancel a testing appointment. W.I.T.S. is not responsible for expenses incurred by the applicant due to cancellation of a test session, location changes, time changes, testing site equipment malfunctions, or other events/incidents. Candidates requesting to reschedule a testing appointment must contact W.I.T.S. at least 72 hours prior to the scheduled appointment. Rescheduling is subject to availability of space at a testing site. Applicants incur a $75 fee for rescheduling an examination. Applications and corresponding fees are valid for one (1) year from the date of submission. Applicants who request to withdraw a certification application within three (3) business days after receipt by W.I.T.S. or an applicant determined by to be ineligible to test will be sent a full refund of the examination fee, minus a $25 processing fee. Candidates who reschedule an examination less than 72 hours before their appointment, fail to appear for the scheduled examination, or arrive late and are refused admission, will forfeit the entire examination fee. 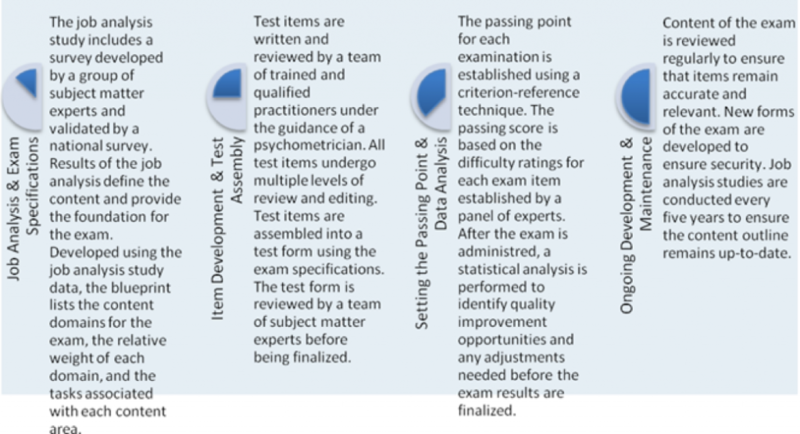 with generally accepted psychometric, educational testing practices, and national accreditation standards for certification programs as described below. As a certification organization, W.I.T.S.’s role is in developing and administering certification examinations to determine the qualifications of candidates for certification. W.I.T.S does not require, provide, or endorse any specific study guides, review products, and/or training courses. Candidates may prepare for certification examinations with any educational materials they choose. Purchase of review materials is not a requirement for testing, nor does use of any review materials guarantee a passing score on a certification examination. The content for the examinations are determined based upon the exam blueprint and content category weights developed from the Job Analysis Study. The final exam content outlines and corresponding content weights are outlined below and also published on the W.I.T.S. Website at https://www.witseducation.com/fit/certification/national-test-eligibility-requirements-exam-forms. The CPT-Level I is comprised of a two-part examination in which one part consists of a 100 multiple-choice examination and the other part is a performance-based (practical) examination. The written examination must be taken prior to the practical examination. The written examination of the CPT-Level I is a paper-and-pencil format which consists of four-option, multiple-choice questions. Candidates are allotted 2 hours to complete the examination. The practical examination of the CPT-Level I is a hands-on performance-based format comprised of one scenario followed by four (4) main sections. Candidates are allotted 30 minutes to complete the examination. All W.I.T.S. certification examinations are prepared and offered in English only. Special accommodations requesting translation dictionaries and/or extra time on the examination are not permitted. All W.I.T.S. certification examinations are offered during established testing windows. The written examination is offered in a paper-based format. The practical examination is a performance-based format. W.I.T.S. delivers certification examinations at authorized testing sites located across the United States. Colleges and other post-secondary settings with testing centers that offer paper-pencil or internet based testing in a controlled, proctored environment serve as testing sites. Practical examinations may also be administered at authorized fitness centers. Candidates are eligible to take W.I.T.S. Examinations after their application has been approved by W.I.T.S. certification staff. To ensure a fair and consistent environment for all candidates, examinations are delivered under strict security with standardized procedures. Candidates are required to follow all test site procedures and appropriate examination conduct at all times. Failure to comply may result in termination of a candidate’s testing session, invalidation of the candidate’s test score, and/or disciplinary action. Because of the secure nature of the examination, W.I.T.S. will not disclose examination questions or candidate’s responses to individual questions. To gain admission at the test site to take a W.I.T.S. examination, all candidates are required to present a valid, government issued, photo identification. The candidate’s name on the identification card must match the name on the candidate’s application form. A candidate will not be admitted to a test site without proper identification and if his/her name does not appear on the official W.I.T.S. Exam Roster for that test location and date. The name on the identification must match the name printed on the official exam roster. W.I.T.S. maintains that the examinations are administered via a secure, standardized testing environment to ensure results for all candidates are earned under comparable conditions and represent fair and accurate measurement. All certification exams are continuously monitored by at least one proctor (written examination) and one examiner (practical examination) at all times. Candidates are required to sign in and out on the official exam roster whenever entering or exiting the testing site. Examinations are proprietary, and content must not be shared with others. No cameras, notes, tape recorders, Personal Digital Assistants, tablets, pagers, or cellular/smart phones are allowed in the testing room. No personal items, valuables, or weapons should be brought to the test center. The only item allowed in the testing area is identification. W.I.T.S. is not responsible for items left behind. No questions concerning the content of the exam may be asked during the testing session. Eating, drinking, or smoking is not permitted at the testing center. Candidates should dress comfortably. While testing centers strive to ensure the test is given in a room that is neither too hot nor too cold, candidates should be prepared with appropriate dress. Candidates must arrive at least 15 minutes prior to the scheduled testing time. Once the examination has begun, no additional candidates may be admitted. Candidates who need to leave the testing room during an examination may do so, after notifying the proctor, one person at a time. No additional time will be allotted. No test materials, test documents, notes, scratch paper, or erasable whiteboards of any kind may be taken from the examination room. Candidates must act in a responsible and professional manner. Any candidate who does not comply with W.I.T.S. policies and procedures or exam restrictions may be asked to leave the testing site and will have to reschedule the exam at the candidate’s expense. A proctor irregularity report will be filed with W.I.T.S. Candidates will be observed at all times during testing. Security procedures are in place and will be enforced. Candidates must do their own work. Any indication to the contrary may void results and invalidate certification. is observed with notes, books, or other aids. Any incidents of suspected cheating, violation of any W.I.T.S. Test site policies, disturbances, attempts to remove test materials from the testing room, or other exam-related irregularities will be reported immediately. All serious incidents will be investigated. Testing irregularities may result in termination of a candidate’s participation in the examination administration, invalidation of exam scores, or other disciplinary action .W.I.T.S. Reserves the right to investigate any test irregularity and to require retesting and/or cancellation if such irregularity cannot be satisfactorily explained. W.I.T.S will provide reasonable and appropriate testing accommodations in accordance with the Americans with Disabilities Act (ADA) for individuals with documented disabilities who request and demonstrate the need for accommodation as required by law. ADA regulations define a person with a disability as someone with a physical or mental impairment that substantially limits one or more major life activities. W.I.T.S requires verifiable documentation to ensure the individual qualifies under the ADA as a disabled individual, and to allow accommodations to be specifically matched with the identified functional limitation to provide equal access to all testing functions. Special Note: Send all ADA document forms to Devon Lewis at dlewis@witseducation.com so we can share them with the hosting college for the national exams to be given as scheduled. are regarded as having a physical or mental impairment. submit documentation at least four (4) weeks prior to the testing date. testing accommodations should be contacted within four weeks of the exam date to verify that appropriate accommodations will be made at the designated testing site. Responsibility to verify with W.I.T.S. that accommodations have been made rests with the applicant. This section is to help you get some essential answers to some of the more requested questions to our group. Should I take a review course of purchased study materials? How you prepare for the exam is up to you. The Certification Council does not require, provide, recommend or endorse any specific courses or exam preparation tools. The courses offered by W.I.T.S. are optional! Can I get a copy of the exam that I failed? We will not release the exam or any portion of it under the circumstances. To do so would be a violation of our security procedures. Access to the examination is carefully controlled and limited to only those individual who must have access for the purpose of examination development and quality control. If I did not pass the exam when can I retake it? A minimum of 4 retest dates are secured every year to meet the demands to retest in a effective efficient fashion in locations around the USA. Does my certification expire? The certification must be renewed with 20 continuing education credit hour courses every 24 months. a 1 hour presentation that is delivered at two different conferences can only be claimed for 1 CE credit.